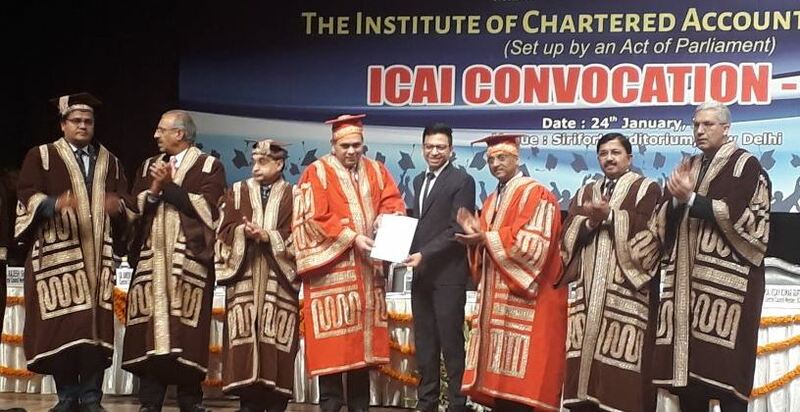 New Delhi: The Institute of Chartered Accountants of India (ICAI) organised its annual convocation today i.e. on January 24, 2018 to award certificates of membership to over 2500 new members and facilitate rank holders of the recent CA examinations at New Delhi. The Convocations at 8 centres across India were also organised today in the other 4 regions i.e. East, West, South & Central region of ICAI Shri Injeti Srinivas, Secretary, Ministry of Corporate Affairs was the Chief Guest at the ceremony organised at New Delhi. The gathering was also addressed by CA. Naveen N. D. Gupta, Vice-President, ICAI and Central Council Members, ICAI. Shri Injeti Srinivas IAS, Secretary, Ministry of Corporate Affairs, Govt. of India congratulating the new Chartered Accountants said, “The fact that the institute (ICAI) is set up by an act of parliament is an endorsement that Chartered Accountants perform a critical role in nation building. In this context, the newly inducted CAs should feel empowered but these powers also come with lot of responsibilities .They should be aware that the Chartered Accountant Act also has built in safeguards to protect the accounting professionals from unnecessary interferences in their work.”. The ICAI conducts Convocation twice every year to award Certificate of Membership to newly enrolled Members as bonhomie to the CA fraternity. The Convocation is intended to bring young members of the profession under the umbrella of the fraternity of Chartered Accountants and foster a sense of belongingness to the profession and the Institute. The Institute has been striving for constantly equipping its members to deliver professional services of the best standards with greater credibility, reliability and accountability. The Institute would continue to provide guidance for the growth of profession in line with changing requirements of stakeholders and enable full utilization of capacities of the Indian professionals at National as well as International level.